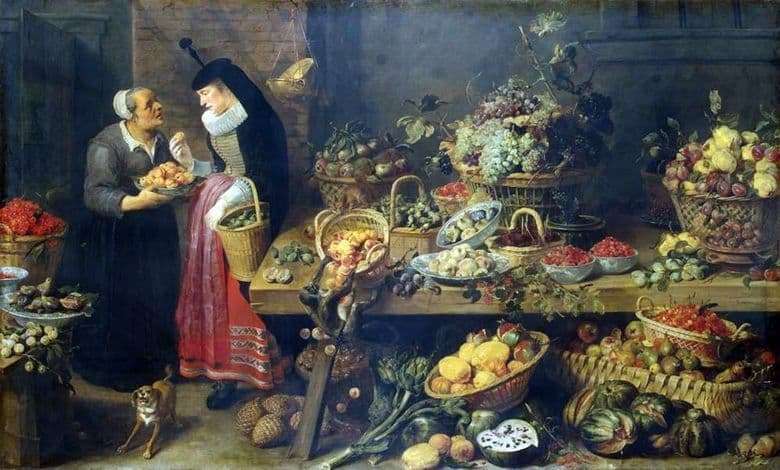 This still-life Fruit Shop by the Flemish painter Frans Snyders’s Fruit Shop is one of the most valuable reproductions of the State Hermitage Museum of Russia. This picture is one of 4 works of the series called “Stalls”. There is a tradition that her order is one bishop to decorate the dining room in the palace. At that time, paintings on such subjects were in great demand and popularity. In the still life of this author all the fruits are depicted in large sizes and fully cover the entire space of the canvas. The author has created his masterpiece as something integral. Here, each item creates an overall picture. Paint artist used bright and saturated. To give the picture significance. The canvas depicts the shopkeeper and the wealthy customer. A dog runs alongside, and one monkey even tried to climb into a fruit basket and knocked it over. Visible to the plot dynamics. A small dog is barking, the second is trying to escape and escape punishment. It is clearly visible that the seller and the buyer are talking. In the picture, everything is not only built dynamically, but rhythmically, plastically and brightly. The author showed the fertility and splendor of his native land, its generosity and simplicity. Why not just find in the fruit shop! There are peaches, figs, apples, quinces, blackberries and more. Counters bursting with plenty of watermelons, plums, lemons. At first, the gaze stops on the overturned basket, but soon the interest in it is lost and again I want to admire the juicy fruits, enjoy their unsurpassed aroma. Perhaps the author’s goal was to whet the appetite of the viewer. People, animals, nature – all this could convey the artist with incredible simplicity and ease. No wonder his paintings were very popular and sold quickly. There was no release from orders.